After the Vanquish Zagato Coupe debuted at the Concorso d’Eleganza at Villa d’Este in May, Aston Martin has stunned showgoers at the 2016 Pebble Beach Concours d’Elegance with the Volante convertible version. Reportedly driven by “overwhelming” customer interest for the hardtop, the Volante will be limited to just 99 cars, with a price believed to be upwards of £500,000. It’s the latest creation from a six-decade partnership between the British sports car maker and the Italian coachbuilding company. 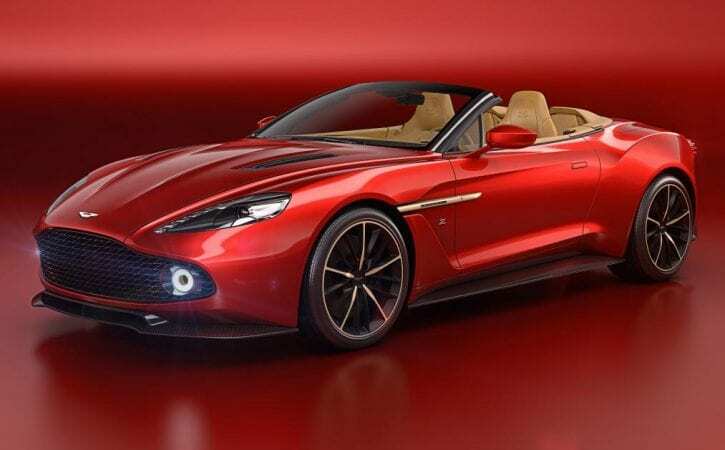 The Vanquish Zagato Volante uses the same V12 as the hardtop, with 592bhp and a projected 0-62mph time of 3.7 seconds. The styling is radically altered over the standard Vanquish, with a gaping grille, striking LED running lights and a shapely rear end. You lose the shapely roof profile of the coupe, but you gain twin cowls on the rear deck, plus the same cloth folding roof mechanism as the Vanquish Volante. Aston Martin’s specialist ‘Q’ division can personalise the cabin to your heart’s content, too, with options like anodized bronze detailing and Bridge of Weir leather. Customer deliveries for the Zagato Volante will begin in 2017.